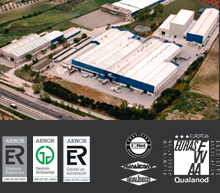 Our factory and head offices are located at Autovía A3, Km. 52,300. 28590 Villarejo de Salvanés (Madrid). You must take exit 51, continue along the service road (right) and turn left in order to continue via said service road. The best option from the airport is via Taxi. Instruct the driver to take exit 51 of the A3 highway, in the direction of the service road. At the crossing turn left, continuing along said service road; our installations are located at the end of said road.